i’m not sure how many of you out there have tried, or heard of, 5 star bars..? they’re small chocolate bars that come in various flavors like: caramel, peanut butter, fruit and nut, and my favorite, granola! it’s the kind of chocolate bar that’s so small that you don’t feel that guilty eating it, but then once you take that last bite you’re thinking “what did i just do?” basically, they’re best eaten by two people, or – if you have enough willpower – save the last half for another time. 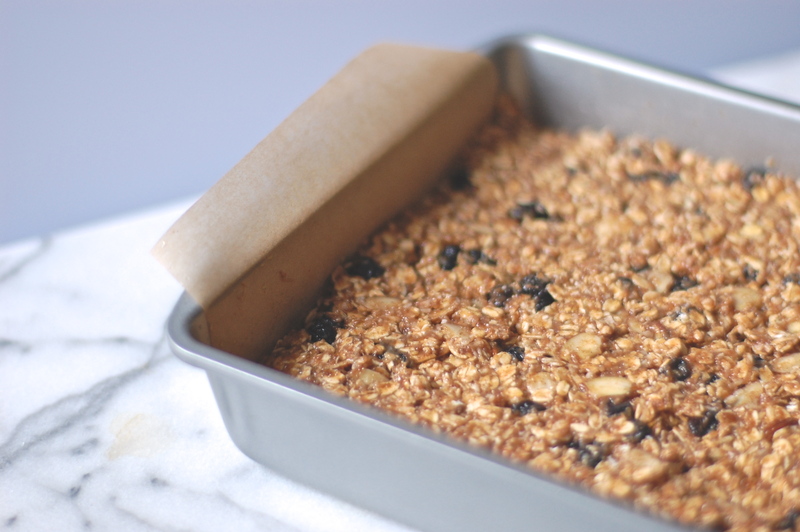 in any event, the recipe here is inspired by the amazing 5 star granola bar. i didn’t think i would come close to replicating it, and i didn’t. i suppose i wanted to make a slightly healthier version of it – making it more granola bar with some chocolate, versus, a chocolate bar with some granola. i found the granola bar recipe from Whole Living Magazine. 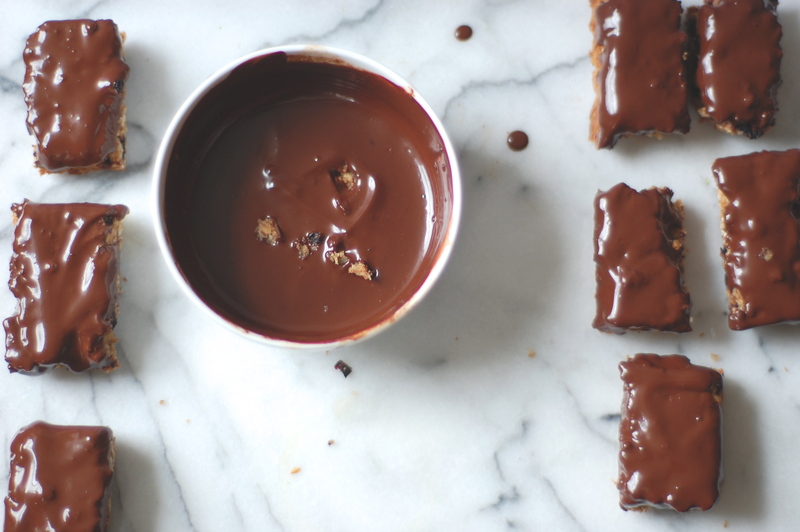 the bars are vegan (you just need to substitute the honey for agave) and gluten free. they’re naturally sweetened with honey and unsweetened applesauce. plus, it’s a recipe that can easily incorporate any additional flavors that you enjoy – i added shredded coconut and sliced almonds. i also thought the flavors in the bars were well suited for a layer of dark chocolate. turns out i was right. the lightly sweetened granola bars work really well the sweetness of (i used 65% cacao) dark chocolate. you may want to leave a few without chocolate; they’re really good on their own as a breakfast bar or a snack.